The more we take power away from government, corporations, and other outsiders, the more that our folk and community can benefit. To remember traditional skills such as bread baking is to take power back into our own hands, and away from the over-specialised modern world. 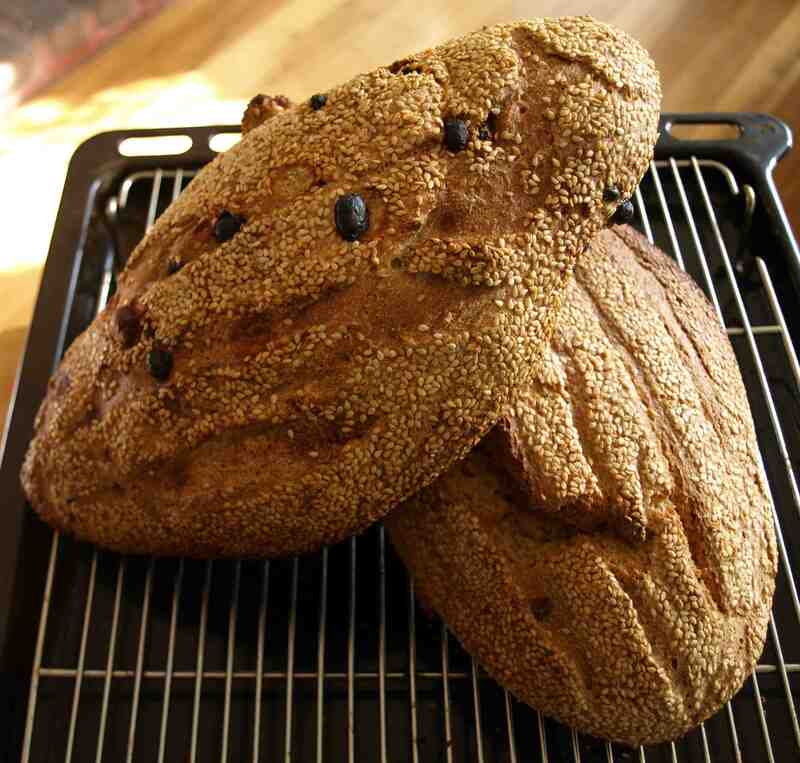 We can bake delicious bread from 100% whole wheat flour, not having our food nutritionally watered down to satisfy ‘artisan’ and consumer pretensions about what bread should be. Anyway, here’s the recipe. It requires a bit of time, to develop flavour and a longer keeping quality, but it requires no kneading, and minimal effort. This makes 2 big loaves, which I bake on a pizza stone. The recipe can easily be halved, the dough can also be refrigerated for up to two weeks at any stage of the recipe. 1 bowl or bucket with a lid or cover, to hold at least 5 litres. mix together and leave for 8-20 hours, around 12 hours works best. leave for 8-20 hours, then cook. Preheat the oven with a pizza stone in it to 200-240c depending on how hot your oven is. Shape the loaves, I usually add a handful each of sultanas, currants and almonds and a tablespoon of barley malt syrup or sugar to one of them by spreading the dough into a flat rectangle, then rolling it up with the fruit and syrup in it. Coat the loaves in seeds or cornmeal, then slash the top of the loaves about half a cm deep with a bread knife and put on the pizza stone. Brush with hot water, then bake for about 40-45 minutes, brushing with water every 5-10 minutes, it makes the crust a bit better but isn’t essential. Asylum Seekers are once again front page news in Australia. The media and politicians love the refugee issue, it always gets people talking. The whole situation causes a lot of division amongst Australians. Obviously, it’s a serious issue and it must be addressed. Most recently, a boat carrying about 255 Tamils, including children, was intercepted by Indonesian authorities on its way to Australia. The Tamils on board have since launched a hunger strike in an emotional appeal to be allowed in to the country. As countless boatloads arrive and detention centres come close to capacity, K Rudd is once again looking for a band aid solution to the problem he and his fellow globalists have helped create. 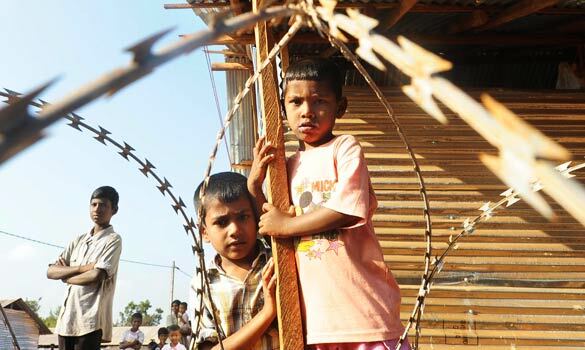 So, what is the refugee issue and how can we appropriately and fairly deal with it? The vast majority of refugees arriving in Australia are coming to escape from a life of poverty and turmoil in their own homelands, where they come from is dangerous and no place to happily support a family. They come here seeking a better way of life and this is understandable. Many Australians tend to support allowing all refugees in to Australia, so they can share our way of life and we can do our part to alleviate their poverty and misery. Unfortunately, the reality is that regardless of how many refugees arrive here, there will be no decrease in poverty levels in Third World countries. The exorbitant birthrates in these countries shows us that almost all people living in dire poverty in these countries will never be able to leave. If there is going to be any real fight against poverty in poor countries, it must happen on the ground and must be sustainable long-term. Accepting boatloads of refugees here is nothing more than a band aid on the problem, it’s only skin deep. A more detailed illustration of this point is shown here. A recent report showed the number of refugees currently receiving welfare payments in Australia; the figures are disturbing. As our population increases, as unemployment increases and the deterioration of our environment continues, our newest arrivals have been drawn in to the trap of welfare dependency. Needless to say, a growing population when our means of production and our environment is strained to the max does not benefit Australians. Any form of mass immigration is only worsening current problems and destroying any social cohesion in our local communities. This “humanitarian” migration does not benefit the poverty in developing countries, it does not help refugees in the long-term and Australians are left to bear the burden in our already strained society. What is humanitarian about a program that only creates a bigger problem in the future, while ignoring the root of the problem in the present? National-Anarchists realise that the refugee count around the world is one largely built on the back of global capitalism. Where starving Africans are denied local autonomy due to globalisation (e.g. Chinese “investors”), or Afghans are displaced due to foreign imperialism, the cause of the problem rests largely with the global capitalist system. We see the plight of these desperate people and want to see an end to their poverty but we want a holistic solution that promotes their independence and self-sufficiency. National-Anarchists fight for the end of global capitalism and a stop to foreign interventionism at the behest of the United Nations or imperialist States. We promote Third World countries returning to a more organic existence – with the adoption of permaculture practices, traditional communities and local autonomy. This is not only viable but completely logical. The money currently thrown away on quick fixes and the resources spent on trying to force liberal-Democracy on the world could just as easily be spent teaching sustainable agriculture and industrial practices to communities in developing countries. This is a plan that will take work and co-operation but it’s the best alternative to continuing a ridiculous “humanitarian” migration and aid program. We don’t pretend to have all the solutions but we think outside the current dogmas and show the dedication to improve the world we live in. If you’re looking for a social alternative to capitalism and communism, get involved with the National-Anarchists. BEYOND LEFT AND RIGHT – FORWARD! To grow food is such a positive way of attacking the system, and taking action in our own lives produces all kinds of benefits. It provides us with the healthiest and tastiest food, connects us with our ancestors, and helps us to realise the real connection we can have with the land, which we are so cut off from in the modern world. By growing food we are making a statement to the system, that we do not want to be a part of the unsustainable, toxic mess that is capitalist, exploitative food production. We are taking action to participate less in this system, we are moving forward. But what to do when there is no space at home? Do we try to find a nearby community garden, where we theoretically should be welcomed, or do we take action with our own hands and minds to create something that truly belongs to the community? community gardens seem to be made exclusively for those living in housing department tower blocks. While these people need to be connected with the soil as much as anyone else does, We also believe they need the empowerment that comes from being involved in the decision making. Instead of engaging and empowering the community, the actions are taken out of pity, by well meaning but misguided folk. Rather than engaging the community in the decision making, decisions are made for them and each interested party given their own little bit of space, individualism is encouraged in what is supposed to build community! Not long ago, some Victorian National Anarchists took back a little unused space in the name of sustainability and community empowerment, this was a strong action against capitalism. This garden was created on a block of land in the inner city that had sold several months ago. It was covered in weeds and left untouched by the owner. We found this to be a very appropriate place to make a statement against capitalism. a small amount of worm poo for added nutrients. We will later sprinkle some dolomite lime on this, to add to the calcium and magnesium content of the growing mixture. We will also be feeding the plants with diluted seaweed liquid, and extra worm poo as they continue to grow. top of that, to add to the drainage, and to provide nitrogen and humus as it decomposes. On top of that was another two bags of compost, one bag of potting mix, and a good sprinkling of worm poo. three spaghetti squash seeds, to be thinned to one plant once established. While this isn’t the most sustainable way of growing, we hope to eventually make a compost heap, using commercial waste such as cardboard and coffee grounds that would otherwise go to landfill. Hay can also be grown on site, in time, as can green manure plants, to bring fertility and humus to the soil. This no dig method of growing requires minimal time, uses minimal water, and means that we can use potentially contaminated land. It is an ideal system for this revolutionary reclaiming of land. 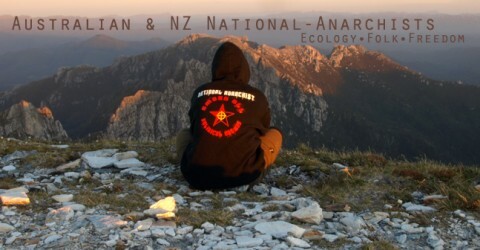 Welcome to the website dedicated to National-Anarchism in Australia and New Zealand. The website will feature news and information for and about our activism and the ideals we pursue. We have used various blogs and networking sites in the past to share our ideas, now we are excited to have our own website. Here you can expect to find reports, essays, interviews and exclusive activist related content of interest to National-Anarchists and radicals of all sorts. The Australian National-Anarchists are a network of activists that advocate decentralised communities, economic self-sufficiency, environmental sustainability and cultural independence as an alternative to liberalism, globalisation and capitalism. We believe that capitalism is an inherently exploitative system that places profits before the interests of people and is antithesis to a healthy and free existence as an individual. We consider globalisation to be the destruction of unique cultural identities in this world and the creation of a bland, materialist pseudo-culture based upon corporate symbolism. We oppose liberalism in all its forms, especially the Orwellian political correctness and nanny-statism that is increasingly surrounding our societies. National-Anarchists advocate autonomous local communities. Our communities would be economically self-sufficient and the participants would be able to pursue their own destinies and live according to their will. We believe in cultural and religious freedom and the right to self-determination based on these diverse and unique identities. We advocate an economy that puts the interests of the community first – promoting self-sufficiency and meeting community needs. National-Anarchists advocate entirely stateless societies; we believe in voluntary association and organic leadership without coercion. National-Anarchists are organised throughout the world. Australian National-Anarchists work closely with our comrades internationally to support each other in finding local solutions to our global problems. We also work with various other groups that agree with our aims. Australian National-Anarchists have ties with the Mathaba News Network, New Right AUS/NZ, American Revolutionary Vanguard, CORRUPT, GetUp Australia and more. National-Anarchist activists are also involved in local volunteer organisations, serving their local communities with real action. National-Anarchists are involved in community activism, political demonstrations, self-sufficiency and permaculture projects, various political workshops and many more projects that promote and advance our ideas and values. We look forward to more people becoming involved in our network and helping to create a better alternative to the current trend of global capitalism. Thank you for checking us out, stay tuned for much more to come!